Official company providing Halls Crossing Boat Rentals and watercraft rentals is located on Lake Powell, about 95 miles upstream from Glen Canyon Dam, directly across the lake from Bullfrog Marina. The National Park Service maintains a Boater Contact Station at Halls Crossing that is staffed intermittently during the summer with not as many services as Bullfrog, Wahweap, or Antelope Point. 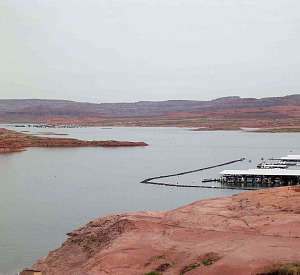 It also provides a public launch ramp and free boat pump-out station with houseboat rentals and slips with boat tours to some amazing canyons on Lake Powell. The nice thing about Halls Crossing Marina is that it’s not as crowded as the other Lake Powell marinas. Halls Crossing boat rentals and waveruners provides many visitor services; housekeeping units, grocery store, 2 campgrounds (one with hook-ups), laundry, showers, service station, and boat repair. Also Cal Black Memorial Airport is located approximately 10 miles east of Halls Crossing for those who would like to fly. The State of Utah maintains a regularly scheduled ferry, capable of carrying cars, trucks, rv’s and trailers, which runs between Halls Crossing and Bullfrog Marinas; however we suggest you call the marina to make sure the ferry is working. This is a fee service and is available on a first come, first served basis. The ferry is occasionally out of service for repairs. Enjoy water sport boat charter services and lesson tours out of Halls Crossing Lake Powell Marina which can including wakeboard lessons, water skiing, wake surfing, kneeboarding, and wakeskating.